Whether in health, social care, education, criminal justice; it is critically important to understand, learn from and build upon the experiences of those who have been through the system. In some cases, such as the Care Act, the need to do this is even legally-binding. Collaborative Pairs help organisations make sure that they are doing this in an organised, logical and effective way. What is a Collaborative Pair? A collaborative pair is made up of a professional from the organisation and a person with lived experience. This could be a former patient or a pupil, for example. The person with lived experience will be able to bring their voice to the project, and by being part of an equal partnership with the professional, they can start to influence and co-design the future of the service together. They also have a critical role to play in gathering further feedback and opinion from other service users, and as someone who has been through the same journey, they are ideally-placed to foster trust and openness. In a collaborative pair, there is no one person who is more important than the other. It is crucial that both parties feel valued and that their opinions are respected. This extends itself to practicalities too. In our case, Alex is remunerated at the same rate as I am. In other collaborative pairs, it may be that different remuneration or reward systems are designed, but this is dependent on the wishes of the individuals involved. In principle, they should be equally weighted, although the individuals may choose to be remunerated in different ways. We have developed our own approach to developing Collaborative Pairs that incorporates a range of person-centred thinking tools. You can find out more about our approach by clicking on the image below. How can Collaborative Pairs help us to support people better? Collaborative Pairs help us to support people better by ensuring that co-production is happening right from the start of a project, led by those with lived experience and their partner. This is an effective way to build trust with the user groups, leading to better relationships and ultimately people-led solutions. 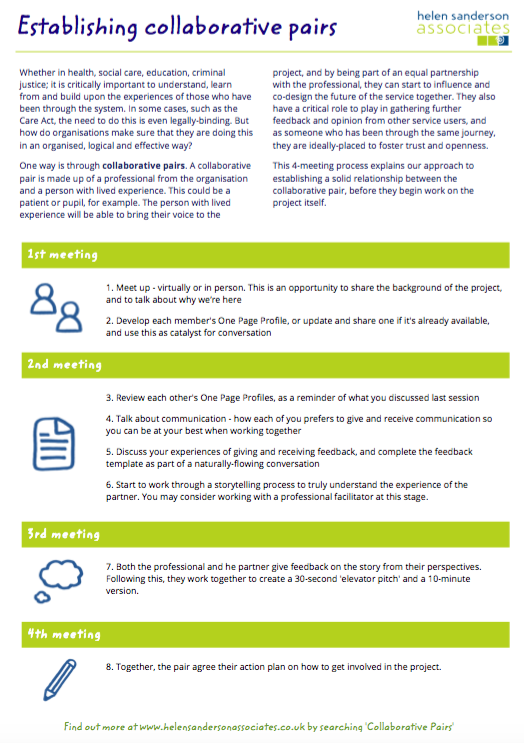 We can also offer bespoke organisational support or one-to-one support for people and organisations who want to learn more about Collaborative Pairs. Please contact us for more information.